Often discussion in between roulette advantage players is about the accuracy of human clocking when timing the roulette ball. I believe this article will provide valuable information on that subject. This short video demonstrates roulette computer predictions. For this experiment I use modified FFV roulette computer, instead of vibration, it provides signals with flashlight ad beep sound. After taking ball time, roulette computer predicts with a beep when the ball is above predicted number. Of course, predictions at any moment during the spin and possibility to clock at any position is a challenging task. The software is well designed to handle it. There is no perfection since the roulette ball deceleration can be very complicated to calculate. In addition to all problems have in mind that the FFV roulette computer on top of prediction has to process and time when the decelerating ball will meet predicted number which also moves. Considering the complexity of the task final result is good. On the picture, you can notice distribution of predictions recorded on the video. Results from taken time measurements at different diamonds are with different colours. You can see, the results are very similar. To find a distribution of clocking mistakes, we don’t need clocking at all diamonds but only at one. Showing some FFV capabilities doesn’t hurt, as you can see that clocking at different positions it didn’t inject any significant errors. Perhaps my talking while timing the ball did bring some mistakes. I also sorted results by the rotations of prediction. You could see data from earlier rotations is only with two ball rotations clocked, a bit less accurate. With such predictions and knowing that the wheel is in level, prediction results are still O.K. Results at 10th ball rotation would be better if instead of 2, more ball rotations were clocked. The hardest part was counting marked dots. I counted 52 within 3 numbers (20, 14, and 31). It is 72% of all predictions. If all predictions were after eighth ball rotation with at least three ball rotations clocked most likely the percentage of good predictions within +-2 pocket would be above 90%. For none advantage players wishing to get rich overnight; please do not understand it wrong. This video and data do not show the total accuracy of predictions compared to result or to ball drop point, but only the deviation in predictions caused by different clocking. 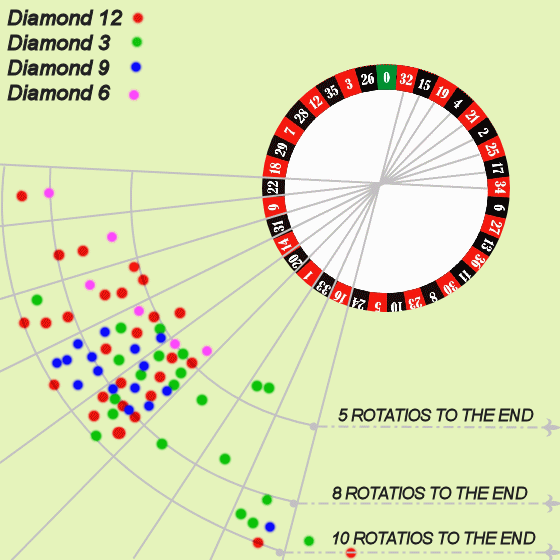 If the roulette computer is well designed with at least 3-4 ball rotations clocked human clocking mistakes do not have a big effect on predictions. This roulette wheel has reasonably slow ball deceleration making it harder to have stable predictions. Most predicted ball rotations have differences in between them of only 100ms. 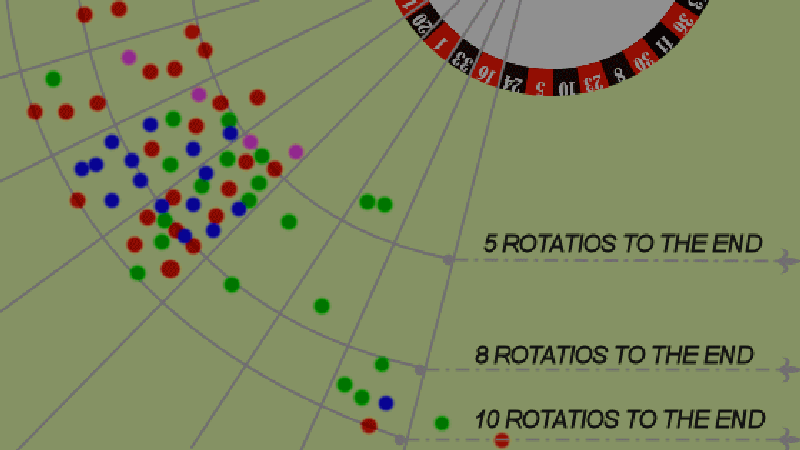 On some older roulette, wheel’s predictions would be more stable even with only two ball rotations clocked. Good test for roulette clocking mistakes.